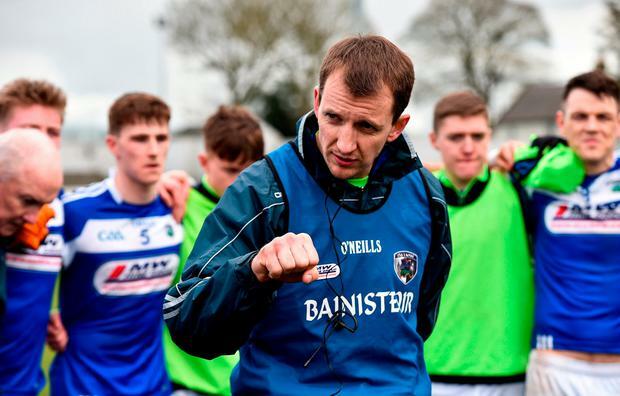 Aided by a third-minute goal from Gary Walsh, Laois secured a return to Division 3 and claimed the bragging rights over neighbours Carlow in this scrappy affair before an attendance of 4,000 at Netwatch Cullen Park yesterday. 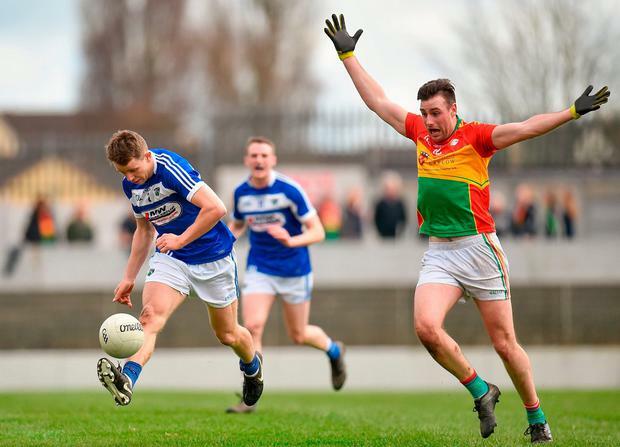 Both sides entered the game with 100pc records and with Carlow already promoted, it put the onus on John Sugrue's men to nail down their promotion slot. They went about their business from the throw-in, gaining possession and retaining the ball for some three minutes before finally piercing the home defence, allowing Walsh to find the corner of the Carlow net. Laois were the superior force for most of the opening half, as the early goal unsettled Turlough O'Brien's side. 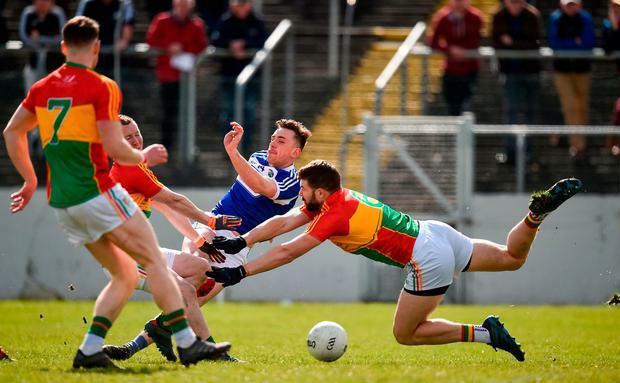 Carlow adopted their usual massed defensive style, but with so many players committed to the back, found it very difficult to put any significant pressure on Laois. With scores at an absolute premium, Laois went into a 1-4 to 0-2 lead by the 26th minute. For the remainder of the half Carlow showed improvement, with midfielders Brendan Murphy and Sean Murphy gaining a degree of control over a strong Laois pairing of John O'Loughlin and Kieran Lillis. At half-time, Laois led 1-5 to 0-5. The second half was a dreary affair, as Carlow recorded three points to a single Laois point from a free by Donie Kingston on 67 minutes. The home side had one great chance of a goal from substitute Jordan Morrissey late in the play, but he opted to punch the ball across the face of goal when a shooting opportunity was a better option. 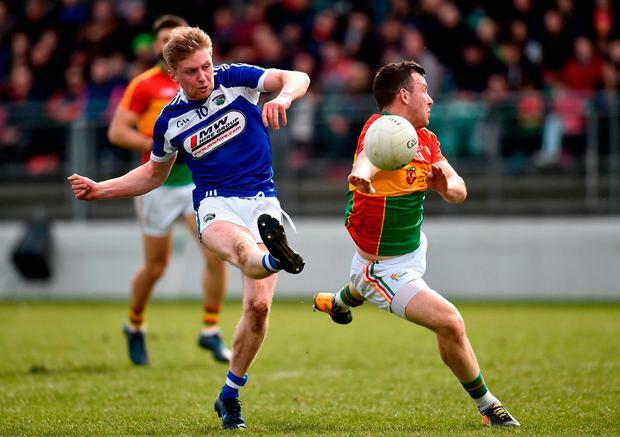 Carlow could not gain parity, despite the fact that Laois were reduced to 14 men early in the second-half, when Kieran Lillis was issued a second yellow card. There was a helter-skelter finish to the game, with Carlow trailing by a point and seeking to retain their unbeaten league status. However, when a melee developed deep in the five minutes of injury-time, referee Fergal Smith threw up the ball and when Donie Kingston gained possession, the final whistle sounded. Carlow had only one scorer - free-taker Paul Broderick, who recorded 0-6 from frees and one point from a sideline ball. These counties will clash again when silverware will be on offer in the division final, expected to go ahead next weekend - Laois' final league game against Antrim now being deemed redundant. This was the 10th league win for Laois over Carlow. There was one draw in O'Moore Park, Portlaoise, in 1985 - Laois 0-11 Carlow 1-8. Laois subsequently went on to claim the 1985-86 league title. Scorers - Laois: G Walsh 1-3 (2f), D Kingston 0-2 (1f), A Farrell 0-1. Carlow: P Broderick 0-8 (6f). 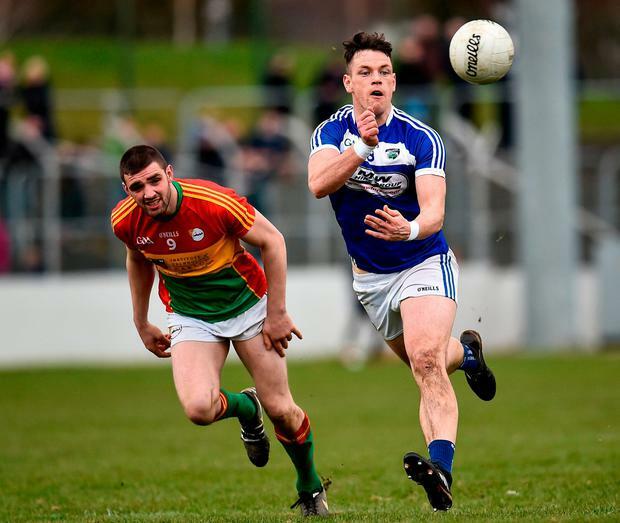 Laois - G Brody 7; S Attride 7, M Timmons 7, G Dillon 7; T Collins 6, C Begley 6, R Piggott 6; J O'Loughlin 8, K Lillis 7; A Farrell 6, B Carroll 5, B Glynn 5; E O'Carroll 6, G Walsh 8, D Kingston 7. Subs: D Strong 6 for Piggott (30), E Lowry 7 for Walsh (50), D O'Reilly for Carroll (56), R Munnelly for Glynn (61). Carlow - C Kearney 6; C Crowley 6, S Redmond 6, C Lawlor 6; D Moran 6, D St Ledger 6, C Moran 6; B Murphy 7, S Murphy 7; S Gannon 6, D Foley 5, E Ruth 5; P Broderick 8, D O'Brien 5, J Murphy 6. Subs: M Rennick 5 for Crowley (40), J Morrissey 6 for D Moran (40), C Lawler for Ruth (52), B Kavanagh for C Moran (63). Ref - F Smith (Offaly).